A person who has the genes for Hashimoto’s but has not been exposed to the triggers will not develop the condition. Additionally, a person who has the genes and was exposed to the triggers but does not have intestinal permeability will not develop Hashimoto’s. New research in autoimmune disease suggests that intestinal permeability always precedes autoimmunity. Another person who has both the intestinal permeability and the triggers but not the genes will not have Hashimoto’s. In this case, they may not have any symptoms at all, or they may develop a different autoimmune condition depending on their genetic background. Bottom line is, all three must be present in order to develop an autoimmune condition. Some people think that genes are destiny, but a new scientific discipline known as epigenetics shows that this is not the case. It’s actually a combination of our genes and environment (which introduces triggers) that determines if we get sick or stay well. Epigenetics has shown us that we can have power over how our genes are expressed by adjusting our lifestyle choices. Environment plays a much more profound role than genes do in Hashimoto’s. For proof of this, we can look to identical twins. We know that identical twins have the same DNA, and in purely genetic conditions, there is a 100 percent concordance rate in twins. This means that if a trait or condition is 100 percent genetic, both twins would either have it or not have it. However, with respect to Hashimoto’s, the concordance rate is thought to be about 50 percent. This means that if one twin has Hashimoto’s, the other one only has a 50 percent chance of developing it. The twin’s unique lifestyle or circumstances contribute to the development of the condition. New research also supports the fact that autoimmunity is reversible. If one of the three factors is removed, a person will no longer present with autoimmune disease. Scientists initially demonstrated this with celiac disease, where gluten acts as both the trigger and the initiator of intestinal permeability. Once gluten is removed, the damaged tissue in the small intestine, which is the hallmark of celiac disease, regenerates. Then, as long as the person no longer has any additional triggers for intestinal permeability, all of the symptoms and autoimmune markers of celiac disease go away. While Hashimoto’s is a bit more complicated, with multiple triggers both inside and outside the gut, I have seen dramatic symptom improvement and remission over and over again with clients and readers who have eliminated triggers or healed their intestinal permeability. What this means for you is that even though you can’t change your genes (not yet at least), you can gain control over Hashimoto’s by addressing your triggers and repairing your leaky gut. I’ll guide you through it. Molecular mimicry theory suggests the cells of pathogens and our own thyroid look similar enough to confuse the immune system, resulting in an attack on the thyroid. The bystander effect theorizes that an infection is present within the thyroid gland and the immune system attacks the thyroid in an attempt to kill the infecting pathogen. Thyroid-triggered autoimmune reaction proposes that any kind of damage to the thyroid results in the gland secreting danger-associated molecular patterns or damage-associated molecular patterns (DAMPs) that recruit inflammatory cells into the thyroid and further damage the thyroid gland. 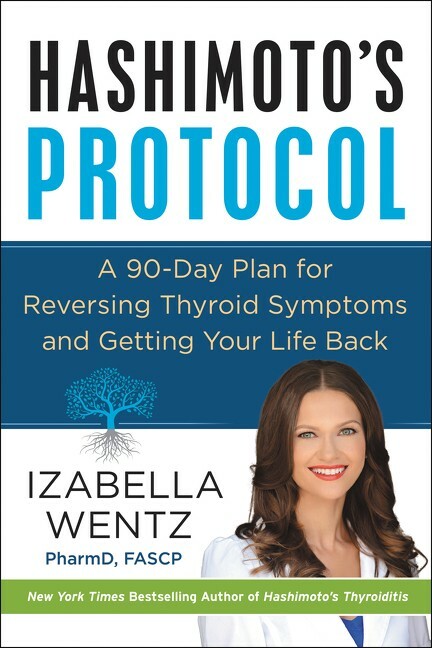 I’d also like to introduce you to the Izabella Wentz Safety Theory of autoimmune thyroid disease. This theory is based on the above-mentioned theories, my work and observations with Hashimoto’s, and adaptive physiology. Adaptive physiology is a concept that suggests that humans developed chronic illness to adjust to our environment and that the illness once served a protective role in the survival of our species but became maladaptive in modern times. In cave times, our bodies adapted to intercept environmental threats as a signal that the world was a dangerous place, that it was not the best time to be adventurous or fertile, and that we needed to conserve resources. In a way, Hashimoto’s and the resultant hypothyroidism may have evolved as an adaptive mechanism to help humans conserve resources and survive in times of famine, invasion, cold weather, or disease outbreak, as the condition put them in a quasi-hibernation mode so they were more likely to retreat to their caves, survive on fewer calories, and conserve energy by sleeping more. In modern times, nutrient depletions, inflammatory foods, stress, toxins, gut permeability, and infections can set off the same danger signal to our body and trigger the autoimmune thyroid cascade. How can we override this signal? In simple terms, we must eliminate the things that make the immune system believe that we are in danger and that we need to conserve energy and resources. I’ve found that there are universal things that everyone with Hashimoto’s can do to feel better, based on my Safety Theory. This theory is the guiding principle for this book — the Fundamental Protocols and the Advanced Protocols work to send safety signals to your body by eliminating perceived threats. Printed from HASHIMOTO’S PROTOCOL: A 90-Day Plan for Reversing Thyroid Symptoms and Getting Your Life Back. Copyright 2017 By Izabella Wentz, PharmD, FASCP. Reprinted with permission by HarperOne, a division of HarperCollinsPublishers.